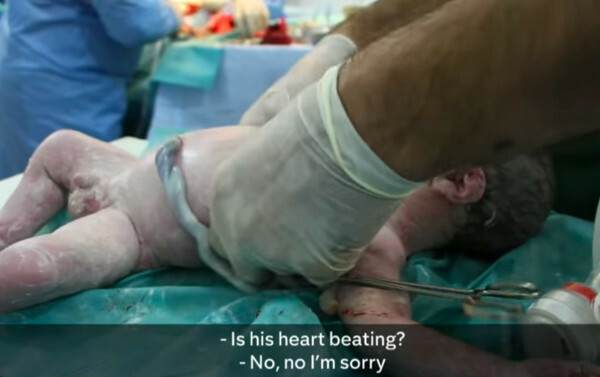 This incredible birth footage is like nothing we’ve ever seen. It’s life, amid so much death. It’s triumph, where there are no winners. It’s pure joy, in a place where there is so much sorrow. A pregnant woman, on her way to give birth gets caught up in war, and we get to witness her baby brought back to life… proving there’s always hope in the strength of the human spirit. There is always so much emotion that comes with the birth of any baby, but this birth is momentous. It unfolds in the war-torn Syrian city of Aleppo, which is being crushed by constant attacks. At nine months pregnant, Mayissa sets off to hospital on foot convinced she’s in labour. But she gets hit in an airstrike, leaving her seriously injured and her baby straddling life and death. She’s rescued and brought to a makeshift operating theatre, manned by an inspirational medical team which risks its life to save the innocent victims of war. They begin by carefully tending to Mayissa’s shrapnel wounds, fearing those in her belly may have impacted her unborn baby. Using the scarce equipment they have available, the medicos undertake an emergency c-section, carefully bringing the baby boy into the world. He’s not breathing. There is no heartbeat. He is struggling for life, before he’s even had a chance to live it. We promise you this story has an incredible ending. The footage below, filmed by Waad Al Katib, contains graphic and distressing images. It’s a world away for most of us, far removed from our reality. But that sweet sound of a newborn’s first cry carries with it the same hopes and dreams in our peaceful country, as it does in one scarred by conflict. The doctors involved, who have witnessed some of the most horrific consequences of war, are so passionately moved by this little warrior’s survival. It’s incredible to watch. Our hearts are understandably heavy at the battles that this baby and his family will face, but the underlying message is one of hope beyond adversity. It’s been reported that both the baby boy, and his mother, are now doing well.